My eye is usually drawn to the traditional materials and tools used when making dulcimers and other instruments. Today my gaze fell on the scene in this photograph. On the stool is the form that holds the sides while I work on the corpse of the instrument. The colorful little clamps are holding the lining strips in place as the glue dries. Clothespins are the old standby for clamping lining in place. I found a few packages of these colorful spring clamps on sale and they work a little better as they have stronger springs. And they come in such cool colors! 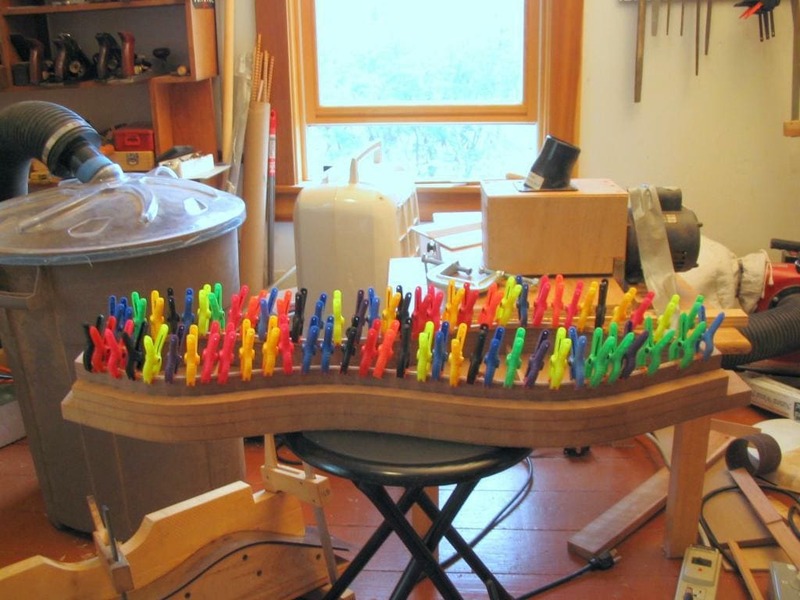 I know, I could tell people that the various colors impart vibrational qualities into the wood making my dulcimers sound better. Hmm, it would be hard to sleep if I did that…. On the floor to the left is a partial view of my side bending form with a pair of sides cooling down. In the background , in no particular order are partial views of a small portable dust collector and it’s accompanying trash can with a cyclone lid, my shop-built thickness sander, a dehumidifier and various odds and ends. There are two fundamental obstacles to the cultivation of willpower; exaggerated regret about the past and excessive worrying about the future.